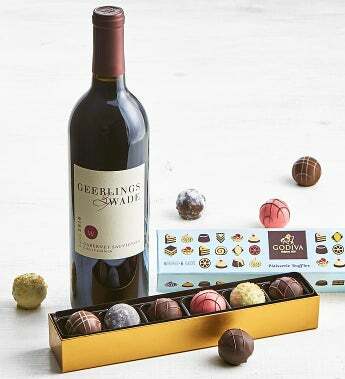 This flight of Godiva dessert inspired chocolates pairs well with this esteemed California Cabernet wine! Godiva's Patisserie Truffle Flight box holds six decadent truffles that celebrate desserts & pastries with intriquing flavors including Black Forest Cake, Strawberry Creme Tarte, Creme Brulee, Chocolate Lava Cake, Tiramisu, and Vanilla Dulce de Leche. This California cabernet pays tribute to the Chateau relationships and history behind the brand. Harvests from extraordinary vineyards located in Napa, Sonoma and the Central Coast converge each year into a wine blend of great quality. The wine is explosive, young: juicy bright cherry over plum - the acids are quickly quenched by the fine, youthful tannin (more tea and tobacco) that promise several years of ageability.